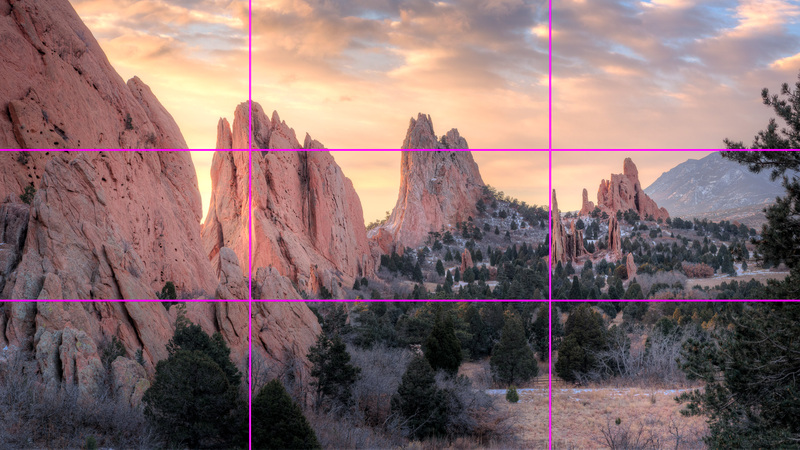 You’ve probably heard of the Rule of Thirds — I learned about it in middle school art classes, and art history in college. It’s a terrific tool for guiding composition in your pictures. Formulaic use of the Rule of Thirds can take you a long way toward making better pictures, and will help you discover better compositions on your own. It’s so universal that Lightroom and most other photo editors include an overlay in the cropping tool. But how do we use the Rule of Thirds when we’re shooting? Following are some ideas for how I use it to help me make photographs. One great way to use the Rule of Thirds is to help you place the horizon. Generally speaking, the horizon should not be in the middle of the photograph vertically. If it’s in the middle, it bisects the image and usually leaves it feeling unbalanced. Instead, place the horizon on the upper or lower third. This first photo has an implied horizon where the shade of the trees falls on the meadow. I placed that line right on the upper third, and I also placed my subject at the intersection of thirds, which I’ll discuss more below. In the cityscape, there are two horizons: the edge of the river and the top of the buildings. I shot it with the upper horizon on the upper third, but I may crop it later so the river edge is on a third as well. When I first started trying to use the Rule of Thirds, cropping was my best friend. Google’s Picasa was my tool of choice, and although I tried to frame nicely in the camera, I was constantly using the crop tool to re-compose my pictures using thirds. Go ahead and use Lightroom, or PicMonkey, or whatever tool you use to crop. Over the years, I’ve refined my eye and I can now shoot this way without cropping at all. My favorite use of the Rule of Thirds is to emphasize important elements in a photo. Our eyes are naturally drawn to elements at the intersections of thirds. As in the picture above, the woman crossing the meadow is situated on the left-hand third, and her head is right at the point where the upper third intersects it. During a photowalk in Seattle, I framed the Space Needle amidst the blossoms on the right-hand third. In this picture, there’s kind of a horizon right about the bottom of the saucer section of the Needle, and I left it more or less in the middle of the frame. See how empty the sky feels? The Needle seems diminished in this picture. I was shooting with a prime lens and couldn’t zoom in closer, but I think the picture looks a lot better cropped tighter so the Needle is not only on the right-hand third, but also at the intersection of thirds. It now looks more proud and doesn’t dwindle in a too-big sky. Framing at the intersection of thirds applies to all kinds of photographs. I bet if you consider photographs you admire, many of them fit these ideas, and many of your own favorites probably do, too. Here are some more examples. I apply this rule to my portraiture, as well, and it’s especially important in close-up headshots. People are often surprised when I cut off the top of the head in a headshot, but it’s really just following the Rule of Thirds. Most people’s heads are about two-thirds face, and one-third forehead. The most important part of the face is the eyes — we’ve got to emphasize the eyes. Placing the eyes on the upper third is a good way to go, and using the intersection of thirds is even better. However, to place the eyes that high in the frame means I either need to move back (which puts a lot more of the body into the picture), or crop the top of the head. There are two major problems with moving back and including more of the body. First, most of my clients would prefer less of their bodies show in the portrait. It’s much easier to pose people in a flattering way if we don’t have to include the body. Second, most portraits and headshots are viewed online, which also means they’re mostly viewed on a phone, and those pictures are very small. moving back makes the head smaller and less visible, and far less personable. We need to move in closer so we can see the emotion in the eyes and make a big impact with the portrait immediately. That means staying close, and framing the eyes on the upper third. Also, hair is just hair, and it changes with trends. A picture showing the hair is easily dated, whereas a portrait emphasizing eyes lasts far longer than current styles. The Rule of Thirds is a handy tool for composing pictures, and using it can make you a better photographer immediately. It’s one of those tools that makes even the most technically minded photographer appear more artistic. Hopefully, the above examples will give you some concrete ways to apply it in your own work. Keep horizon lines out of the center, place important elements on the intersection of thirds, and get in close for portraits to make more interesting pictures with greater impact. And remember, while it’s nice to frame things perfectly in the camera, using the crop tool in your favorite photo editor is an excellent way to train your eyes and refine your photographs. “Cropping in the camera” is a very useful concept, but I find leaving some space (shooting a bit wide) allows for second or third thoughts about small adjustments in composition. It’s easy enough to crop a few pixels; adding them after the fact is problematic. That can be useful, Andrew. For headshots, I actually set my camera to shoot a 16:9 ratio picture, and since I’m shooting RAW I can still un-crop the picture in Lightroom. This way, I can frame for impact and show my client an awesome crop on camera, but still have options later. Still, I hear Jay Maisel’s voice in the back of my head telling me to shoot it right now–only a handful of his photos are ever cropped. Another interesting rule I’ve learnt today. I never understood the grid lines. Thank you.